Although urgent measures were promised by the Norwegian government following revelations of extreme cruelty against Somali-Norwegian children in so-called "Quran schools" in late 2017, the problem is far from solved, according to national broadcaster NRK. 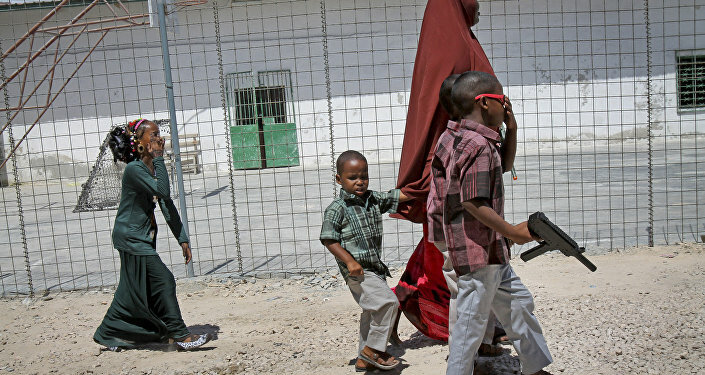 The scandal involving so-called "Quran schools," which were unearthed in Somalia and where brutal indoctrination methods of Western students were widespread, appears to have gained a second wind, as yet another instance of torture was revealed by Norwegian national broadcaster NRK. The "Quran school" that goes by the name of Gargaar bears little resemblance to its counterparts in Norway. It is located in a dangerous area of Somalia's capital Mogadishu that is partly controlled by the extremist al-Shabaab movement. Last year alone, it was attended by at least eight Norwegian students, of which two were minors, NRK reported. According to Somali-Norwegian "Hassan," a former student of the school in question, it has its own torture chamber, where students habitually get chained and whipped for "breaking the rules" or "talking back." An excruciatingly painful punishment of up to 500 strokes on the soles of the feet is the norm there. Professor Torleiv Ole Rognum of the Department of Forensic Medicine at the Oslo University Hospital described this torture method as particularly intense. "The pain propagates upwards in the leg to the knee and can also cause an intense headache. This is a very painful form of torture," Rognum said, citing the numerous sensory nerves in the soles of the feet. He also stressed that it is often used in order to leave as few traces as possible. Among the pupils, the torture chamber is called "City Plaza," after Mogadishu's finest hotel, as some sort of gallows humor. "When in 'City Plaza,' you are nothing. You are not a human being. If you have to pee or take a dump, you have to make it right on the floor. It's the worst thing I've experienced in my life, being beaten and feeling like nothing," "Guleed," another former student, told NRK. A Gargaar employee interviewed by NRK declined subjecting the students to violence and abuse of any kind. He also stressed that they are taught much more that the Quran itself and emphasized that many students coming there exhibit symptoms of drug and alcohol abuse. In a commercial, the school promises classes in gymnastics and computer education. The ad also makes it clear what kinds of students are preferred. "Those born in the West who have never seen their homeland Somalia and deny their culture and religion," NRK reported, citing the ad. Child Ombudsperson Anne Lindboe called for a change in the child welfare act in order to obligate the Norwegian authorities to investigate cases of child abuse against people registered in Norway regardless of where they have occurred, NRK reported. "Somali parents have very high confidence in religious leaders. If an imam or sheikh says the children are safe and are doing well, it's almost 100 percent that they will be trusted more than what the children have to say," Somali-Norwegian teacher and activist Asad Quasim told NRK. At present, there are about 40,000 people of Somali descent living in Norway. "We don't see them taking any Olympic gold medals in skiing in the first place. Somalis live in parallel communities and are often poorly integrated," columnist Hanne Tolg wrote in an opinion piece on Document.no. Tolg ventured that children are sent back to Somalia once they become "too Norwegian." According to the former students, the school currently has about 100 pupils from Europe, the US and Canada.